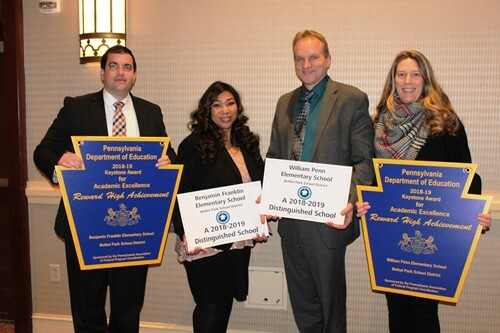 Benjamin Franklin Elementary School and William Penn Elementary School were two of the 153 Pennsylvania Schools to receive the 2018-2019 Distinguished Title 1 Schools Award from the Pennsylvania Department of Education's Division of Federal Programs. The awards were presented on Monday, January 14 during the 2019 TItle 1 Improving Schools' Performance Conference, which was held at the Sheraton Station Square. Both schools received the award in the Reward: High Achievement Category, which puts them among the highest 5 percent of Title 1 schools in the state, based on meeting all four Annual Measurable Objectives: Test Participation in the PSSA Mathematics and Reading Tests, Attendance Rate, Closing the Achievement Gap on the PSSA Mathematics and Reading Tests for all students, and Closing the Achievement Gap on the Mathematics and Reading Tests for historically underperforming students. Accepting the awards on behalf of the teachers at both of these schools were Bethel Park Superintendent Franklin Principal Teresa Doumont, Penn Principal Brian Lenosky, Superintendent Dr. Joseph W. Pasquerilla and Bethel Park Coordinator of Curriculum K-12 Elizabeth Wells.